September 13, 2018 -- A wearable ultrasound device monitors blood pressure in arteries deep under the skin and could help clinicians detect cardiovascular problems earlier, according to a study published online September 11 in Nature Biomedical Engineering. The device's applications include real-time, continuous monitoring of blood pressure changes in patients with heart or lung disease or those who are critically ill or undergoing surgery, wrote researchers from the University of California, San Diego. But it could also be used to track other vital signs and physiological signals. 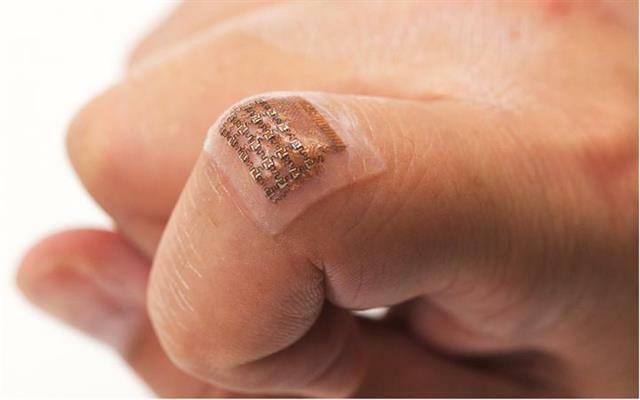 "Wearable devices have so far been limited to sensing signals either on the surface of the skin or right beneath it. But this is like seeing just the tip of the iceberg," said corresponding author Sheng Xu, PhD, in a statement released by the university. "By integrating ultrasound technology into wearables, we can start to capture a whole lot of other signals, biological events, and activities going on way below the surface in a noninvasive manner." The device can monitor central blood pressure in major arteries as deep as 4 cm below the skin, and it consists of a sheet of silicone elastomer patterned with an array of small electronic parts that are each connected by spring-shaped wires. It uses ultrasound to record the diameter of a pulsing blood vessel and then translates the information into a waveform using customized software, wrote the team led by Chonghe Wang, Xiaoshi Li, and Hongjie Hu. The researchers tested it on a male subject who wore the device on his forearm, wrist, neck, and foot, and they collected data on the device's performance while the subject was both stationary and exercising. The wearable ultrasound patch tracks blood pressure in a deep artery or vein. Image courtesy of Chonghe Wang/Nature Biomedical Engineering. The group plans to continue the development of the device by integrating more data processing technology and wireless communication capability. "Right now, these capabilities have to be delivered by wires from external devices," Xu said. "If we want to move this from benchtop to bedside, we need to put all these components on board."